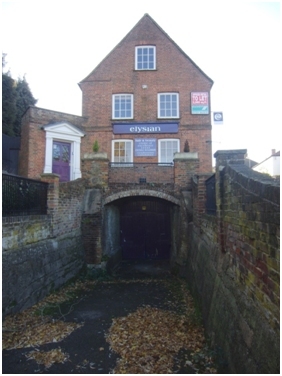 This red-brick building, on the left as you walk up Brewhouse Hill, has a gable end with a cart entrance at basement level facing down the hill. Brewhouse Hill was formerly known as Hamwell Hill, leading to Hamwell, now Amwell. In 1781 James Wilkins of Wheathampstead was granted land by the lords of the manor, Westminster Abbey, on which to build a brewery, which he called the Parrott Brewery. The plot of land on which the brewery stood stretched up the hill to the end of the yard behind this building and its neighbours. The buildings have timber frames behind their 18th and 19th century brick facades and are all Grade II listed. The brewery, by then known as the Hope Brewery, was bought by the Lattimores in 1841. Brewing ceased in 1904, when the Lattimores sold up, and the brewery building has since been demolished. The cart entrance leads into a storage tunnel that runs under the first cottage and stretches well back into the chalk. The cottage and tunnel appear to date to 1781. On the way back down Church Street to the corner with High Street, note Cunnington's lighting shop. This shop and the house on its right, both of which are Grade II listed, were once the 'Walnut Tree' pub; the wrought ironwork from which the pub sign used to hang is still in place. This is a 17th century timber-framed building with a 20th century front extension in plastered brick. The pub may have taken its name from a prominent walnut tree mentioned in a poem about Wheathampstead that appeared in the Morning Post in 1778.